This Light Award is sponsored by Moving Optical Illusions and processed through Kiva.org. 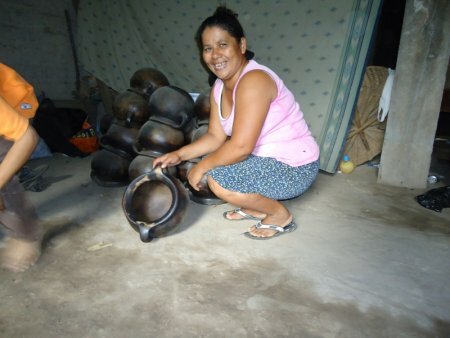 Ms. Maria makes clay tortilla griddles and pots. She is 45 years old, lives with her 10 year old son Ronaldo, and resides in Guatajiagua in the department of Morazan in El Salvador. She has run her business for more than 12 years and her working hours are from 8:00 pm to 5:00 pm. She works alone and inherited this business from her mother. On this occasion she is requesting a loan for the purchase of firewood, clay and nacazcol (a type of dye). She needs these materials to make tortilla griddles and pots. With this investment she will maintain sufficient material to be able to produce many articles to offer to her customers, and it will be an opportunity for her to sell a larger quantity. Her objective is to be able to count on economic solvency in order to finish paying off the plot of land and make it hers, as well as to settle this loan, and so that she doesn't lack food in her home.